Orkney Ferries operate a daily circular route embracing Tingwall and the three islands of Rousay, Wyre and Egilsay. The terminal at Skaill is surprisingly large, considering only 20 or so people live on the island. 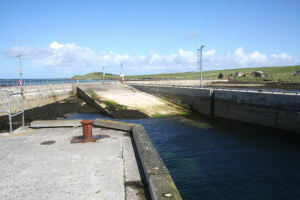 In addition to the slipway used by the ferry, there is another harbour arm which can be used by visiting yachts.